Today’s writing task doesn’t involve writing. Just as well. The instructions are to mine what’s mine. One suggestion is to look at your own tweets and use them to create something. Another suggestion is to look at your tweets and use an automatic tweets-to-poems generator. I’m game. Or rather, I’m algorithm. The Poetweet linked above didn’t generate anything remotely readable from my tweets, so I resorted to plagiarising the produce of another Twitter account. I turned to the authority of BBC. BBC as the news publisher—I beg you not to look up the definition of BBC in the Urban Dictionary. I’m serious. I swear I have nothing to do with the half-open packet of crisps pictured above. I found it like this. Also, I know, you probably call them chips, be my guest. And, if you disregarded my advice and did look up BBC in the Urban Dictionary, serve you right. Some little kid got a few mouthfuls and dropped it! Looks like it! It was funny to come across it though. Almost creepy. 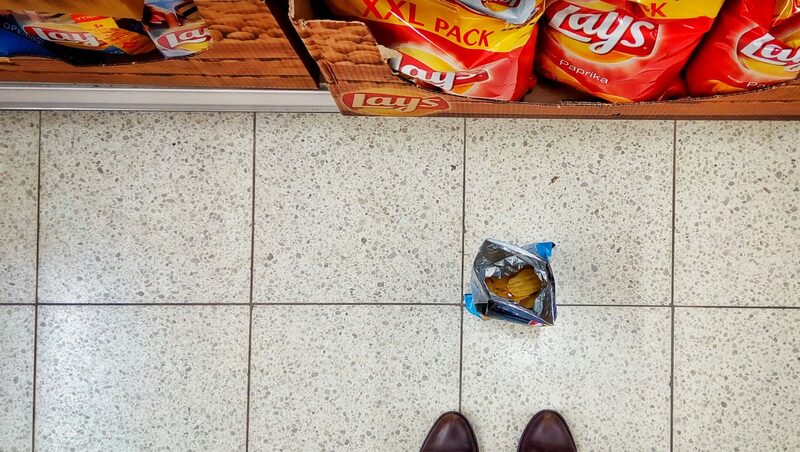 I’ve seen this in grocers here too, someone opens a bag, stuffs some food in the mouth then leaves the bag. Creeps! I honestly had NO idea what to expect 🙂 No, I’m not traumatised. It was just unexpected ! LOL well you did warn me. Now as for your Tweet Poem – what on earth?! Can’t wait for this prompt. Sorry for exposing you to the alternative BBC. Though I did warn you 😉 This prompt was one I enjoyed a lot, try the poem generator, even with different accounts, it’s fun to see what it comes up with! I will! I’m quite looking forward to seeing what happens.